This is a photograph of J. P. and Alice Emery's home in Cimarron, Gray County, Kansas. The people around the pond are, left to right: J. P. Emery, Ilo Emery (middle daughter), unknown, Elsie Emery (youngest daughter), Ethel Emery (oldest child), and Alice Emery. 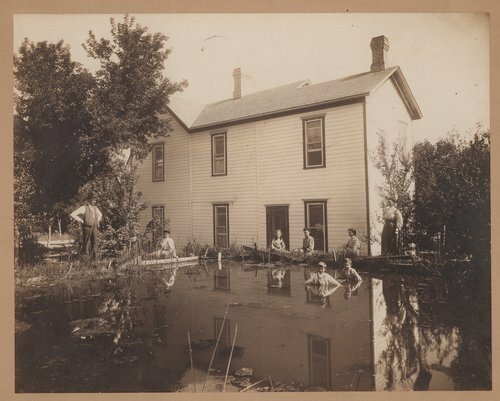 The boys in the pond are, left to right: (Joseph) Fulton Emery (youngest child) and unknown.